At the Baikonur Cosmodrome in Kazakhstan, Expedition 22 NASA Flight Engineer Timothy J. Creamer (left), Soyuz Commander Oleg Kotov (center) and Flight Engineer Soichi Noguchi of the Japan Aerospace Exploration Agency pose in front of their Soyuz TMA-17 spacecraft. A Russian cosmonaut doctor, a veteran Japanese astronaut anda rookie American spaceflyer are poised to blast off Sunday for theInternational Space Station. 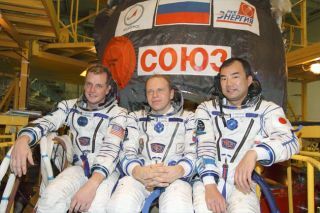 The three spaceflyers are slated to launch Dec. 20 at 4:51p.m. EDT (2151 GMT) on the Russian Soyuz TMA-17 spacecraft from the Baikonurcosmodrome in Kazakhstan. They will spend about two days catching up to the spacestation, where they plan to dock Tuesday. The trio will join space station Expedition 22 commander JeffWilliams, a NASA astronaut, and flight engineer Maxim Suraev, a Russiancosmonaut, onboard the station. Williams and Suraev have been in space sinceOctober, and have been the only two people aboard the orbiting laboratory sinceDec. 1. NASA astronaut Timothy (T.J.) Creamer will be making hisfirst trip to space. Creamer is a former U.S. army aviator who hails from UpperMarlboro, Maryland. He was selected as an astronaut in 1998. "Floating to me is something I'm looking forward todoing," he told SPACE.com. Creamer will also serve as a flight engineer on theExpedition 22 crew. He has been writing about his experiences preparing for theflight on the microblogging site Twitter under the name "Astro_TJ,"and plans to continue tweeting while in space. "Ok folks, it's about 0300local," Creamer wrote on Thursday. "Yes we are time shifting in prepsfor launch, but now am pooped." Creamer's hobbies include sports ?especially tennis ? but not singing. "If Soichi makes me try to sing karaoke onboard thatwould be challenging," he said. "Soichi's got a good voice by theway. Actually there is karaoke software on one of the computers. If they heardme singing, they'd probably make us do an emergency descent." Creamer is also married with two children. Veteran cosmonaut Oleg Kotov, a medical doctor, will commandthe voyage. Kotov graduated from Russia's Kirov Military Medical Academy, and served as a test doctor at the Gagarin Cosmonaut Training Center before beingselected as a spaceflyer in 1996. "I [will be] the designated crew medical officer aboardthe station," Kotov told SPACE.com. "I [will] help them to feelbetter." Kotov previously flew to the orbiting laboratory in 2007,when he served as an Expedition 15 flight engineer for about six months. Since then, the station has grown both in size andpopulation: While the outpost used to host crews of three, it now accommodatessix-member crews. "Having more people to communicate with is an advantage? working together is good," Kotov said. While there are some small issuesinvolved in coordinating such a large cohort in space, Kotov said he waslooking forward to it. "For me, I don?t think this is a hugeproblem." Kotov plans to join Expedition 22 as a flight engineer, andthen take over as Expedition 23 commander in March 2010. Soichi Noguchi of the Japanese Aerospace Exploration Agency(JAXA)is also making his second trip to space. He previously flew on the STS-114flight of the space shuttle Discovery in 2005. In March 2010, Noguchi plans to welcome Japanese astronaut NaokoYamazaki aboard the station when she arrives with the visiting STS-131 spaceshuttle mission. "This is the first time ever that two Japanese[astronauts] are in space, so we're really looking forward to it," Noguchisaid. Noguchi has a master's degree in aeronauticalengineering, and worked to design commercial airplane engines before beingselected as an astronaut candidate in 1996. Noguchi is slated to serve as anExpedition 22 flight engineer. While in space he hopes to stay intouch with home traditions. "If it's possible I'd liketo do some Japanesecooking," he said. Noguchi and his wife have two children.